Check out best of the best nail art ideas inspired by celebrities around the world! Nail art is such a fad these days that even celebrities can’t get enough of it. From caviar nail art to geometrical designs, Bollywood and Hollywood A-listers are trying them all. Let’s take a look at the beautiful, quirky, simple and funky nail art designs for the sake of inspiration! 1. Rihanna’s bright smiley nail art: Rihanna is known for her originality. This is also reflected by her amazing choice of nail art designs. She’s fails to disappoint us with with her mind-blowing smileys and other bright and happy designs that can be easily tried at home by most of us. 2. 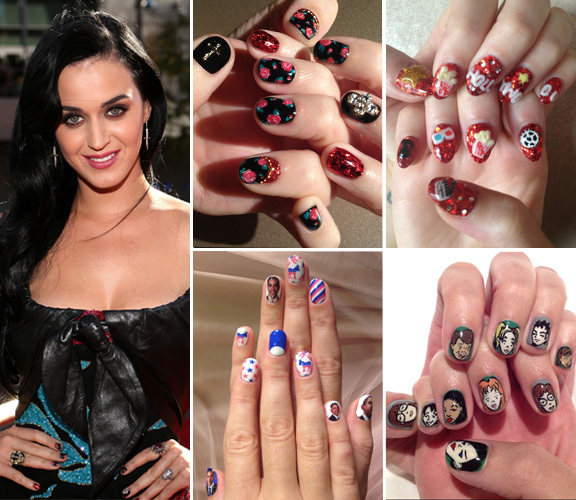 Katy Perry’s quirky nail art: It’s no secret that Katy Perry has an eye for detailed and intricate designs. The singer has been known to sport some of the most stylish and revolutionary nail art designs so far. From metallic floral design to the entire movie cast of Daria, this celebrity takes themes really seriously. 3. 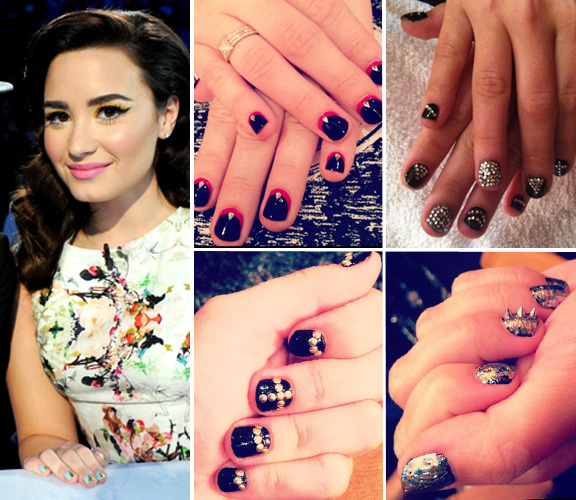 Demi Lovato’s goth look: New kid on the block (in terms of nail art), but let’s not take it away from her. She has been flaunting some of the most exquisite and unique designs. If you are into goth look then she is sure to inspire you. From glossy black and red studded ruffians to blinged-out black and diamond rhinestone for embellishments, Lovato’s nail art designs can blow your mind for sure. 4. 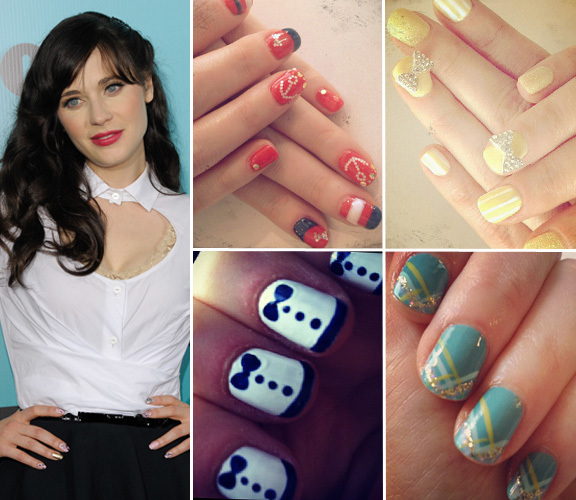 Zooey Deschanel’s cute nail art: Deschanel’s obsession for nail art is on another level now. Her love for everything retro gets a new meaning in the world of beauty. Cute nail art designs with a bit of a retro and vintage feel to it is a dream of most of the girls these days. So, do check out some of the manicures sported by her and wear them on special occasions such as a date night. 5. 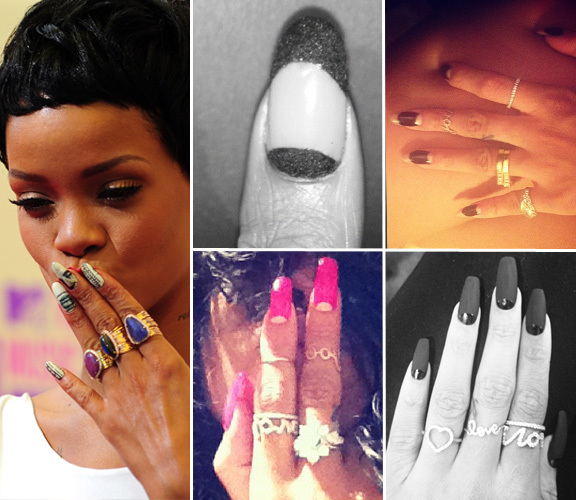 Rihanna’s half moon nail art: Yes! Its Rihanna again, but this time she is back with the elegant half moon mani. Extremely classy and versatile half moon nail art is gaining popularity, all thanks to her. She has been seen wearing half moons way too often now. And this inspires us to go get one ourselves! 6. 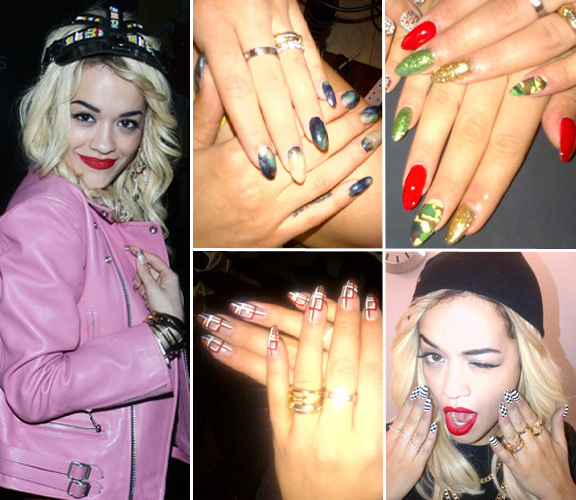 Rita Ora’s graphic nail art: We are simply in love with the cute, graphic nail art designs as seen on Rita Ora’s fingernails. Such striking and 100% unique designs with a psychedelic look of galaxy or the checkered nail art design which is so game-y is not just a graphic representation of the new-age world but it says a lot about her personality too. 7. Priyanka Chopra’s minimalist look: How can the nail art fashion not get Bollywood stars going crazy? Piggy Chops has been sporting a clean, minimalist look with the ultra-cool black nails. This makes her look quite edgy and elegant at the same time. 8. Kareena Kapoor French tips: Kareena’s nails are always in perfect shape. Most of the times you will see her wearing French tips in style. Be it red, or gold, the freshly manicured hands with French tips is capable of grabbing much-needed attention. 9. Malaika Arora’s neat white look: The super hot Malaika’s nails are always prim and proper. Be it for a big ticket event or a small get-together, she knows how to carry it off in style. A black dress with the neat, white fingernails is all you need to get it going for a night out with friends!